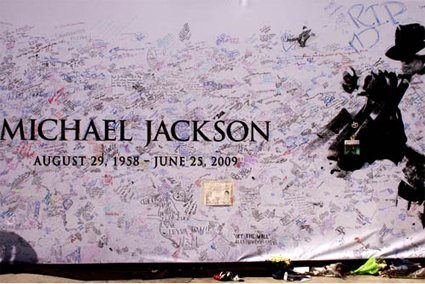 The funeral for the King of Pop, Michael Jackson, will take place at the downtown Staples Center in Los Angeles, CA on Tuesday, July 7 at 10:00am. 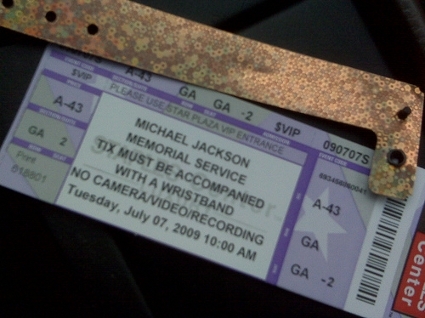 This date and time have been confirmed by the Jackson family’s publicist. AEG Live CEO Randy Phillips has said that tickets will be free, but there is only room for 20,000 in the Staples Center. Furthermore, there are only 11,000 tickets available for fans. And if you wanted to register for tickets, there was a two day registration period. If you wanted a ticket, I hope you registered. 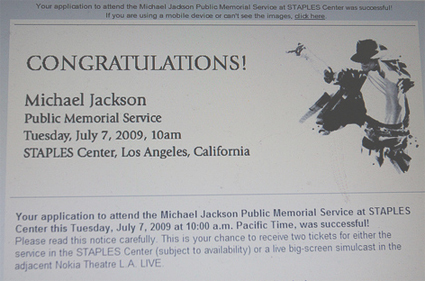 Michael Jackson Funeral Online Registration Successful! I’m not sure how Los Angeles is planning to brace for the amount of people that will decend upon downtown LA on Tuesday morning. The city anticipates anywhere from 250,000 to 700,000 people will show up at the Staples Center arena on Tuesday. For the fans who do not get into the arena, be aware that there will be no funeral procession through the city, and the funeral ceremony will not be broadcast on the giant screen outside the arena. If you want to watch the funeral ceremony live, your best bet is to watch it on TV at home. Also, there will be a private ceremony for the family before the public memorial. In an interview with CNN’s Larry King, Jermaine Jackson, Michael’s brother, discussed the private memorial service on Tuesday. He also discussed the family’s desire to have other memorial services around the United States.